If the download fails, try the mirror. If the download link or mirror link doesn't work, please report it. If an image doesn't work, please report that. 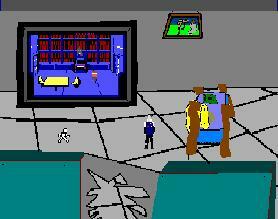 This is the third Jimm's Quest game that I have made, however, the first two are only available at my website, because they are just hacks of Space Quest 1 AND 2. The bad guy is Matthew Lesko, and that's pretty much all the plot I have at the moment. The demo is the intro plus the first three screens.